IRL is pleased to announce the launch of a new title to its collection of studies: A Profile of the Mexican Paint Industry. 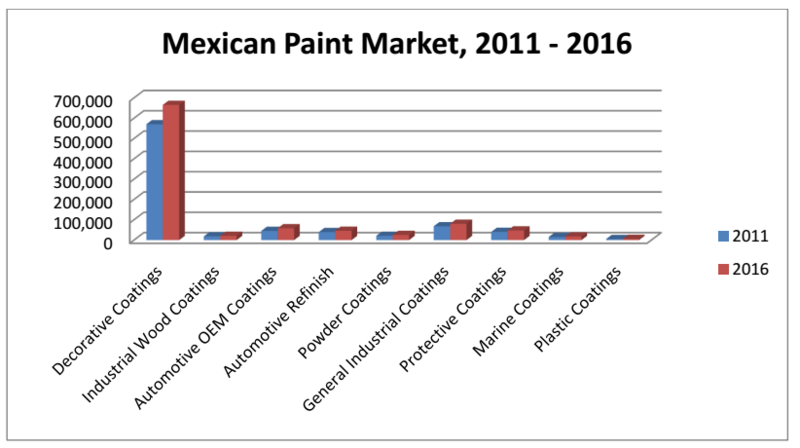 For the first time ever, IRL examines Mexico’s paints and coatings market independently and not as part of a regional study on the Central American paint market, thereby enabling to present more in-depth paint market data and trends. This first edition provides market data for 2011, anticipated figures for 2012, and forecasts to 2016. Mexico’s paints and coatings sector was enjoying a period of rapid expansion until the outbreak of the world financial crisis which, accompanied by an increase in raw material prices, caused the sector to tumble. With NAFTA free-trade agreements in place, Mexico succeeded at increasing trade competitiveness with the USA, bringing the paints and coatings market into full recovery in 2010. Last year Mexico outperformed Brazil in terms of GDP growth (Mexico: 3.9%; Brazil: 2.7%) benefitting the development of the paints and coatings sector, causing it to further expand and reach an estimated demand of 820,400 tonnes. Although the elections taking place on 1 July 2012 have caused the economy to slow-down, this trend has quickly reversed and consumer behaviour and investments have risen once again. Decorative paints is by far the largest market segment, accounting for almost 70% of the total paints and coatings market share but is subject to seasonal demand. Together with Mexico’s increased purchasing power, credit lending has allowed for refurbishment works to drive the construction sector. While many are identifying the development of a second seasonality peak, it is the smaller industrial coatings sector that is foreseen to undergo faster growth rates on average in the next few years -with AAGR of 3.1 % up until 2016 in the decorative segment as opposed to a 3.7 % growth expected on the industrial coatings segment. By the end of the year 2016, the market could reach a demand of 965,000 tonnes. The booming of the automotive industry will be the key driver to fuel Mexico’s industrial coatings growth and will also promote the use of automotive refinishes on the long term. Indeed, the automotive OEM coatings sector is expected to experience growth rates well above Mexico’s expected GDP progress, with the possibility of attaining a 5.2% year-on-year growth rate. Otherwise, new investments into Mexico’s state-run Pemex, which largely dominates the country’s oil and gas sectors, will be the main factor to trigger expansion in most other industrial coatings sectors including the marine, protective and general industrial coatings sectors. On the technological side, a number of reformulations to improve the eco-friendliness of paints have strengthened the existing, but relatively recent, trend towards substitution of solventborne with waterborne coatings. A much stronger use of powder coatings has also been reported. However, despite environmental awareness increasing slowly, there is otherwise not much legislative incentive to promote a faster switch-over towards environmentally-friendlier products. A challenge to be addressed within the paints and coatings sector is that much of the industry still relies on outdated equipment and technologies. In addition, the market remains largely dominated by the giant paint maker Comex. 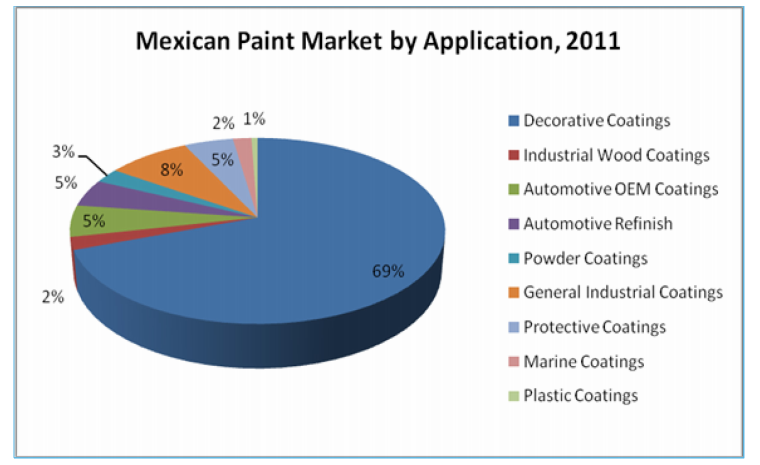 Nonetheless, the outlook for the paints and coatings market sector in Mexico appears highly promising. The country’s per capita paint consumption stands at 7.1 kg/head, a figure considerably lower to that of Brazil, placed at 8.4 kg/head. This indicates much potential for growth in a country that over the past decades has continuously leapfrogged Brazil as Latin’s America top economy.